The Mayor of the City of Whittier, Fernando Dutra, listened with focused attention to PEACE Academy Senior Alfonso Garcia as he enumerated the myriad human rights violations the LGBT community in Russia faces on a daily basis. After shaking hands and congratulating him on his work, the mayor moved on to listen to an impassioned plea by Dorrianna Roberts, Chris Brio and Lance Hazan on how the lack of access to clean drinking water is not only a human rights violation but can perpetuate extreme poverty in developing nations. The message is clear: we need to act now! No one deserves to die of preventable water borne diseases. On April 25, sixteen PEACE Academy seniors from Millikan High School took part in the Amy Biehl Foundation Conference at Whittier College where, along with students from other area high schools including Whittier High School and Pioneer High School, they presented their research on self-selected human rights topics to parents, teachers and professors, business executives, and members of the Whittier City Council. The event included an elegant brunch and award ceremony. Whittier College’s Joyce Kaufman, professor of political science, and Linda Biehl, co-founder of the Amy Biehl Foundation, recognized the students for their work and encouraged them to turn their research into tangible activism. This year, the senior capstone project, ELEVATE, took on the issue of universal human rights violations. To accomplish this, the seniors partnered with Whittier College’s Center for Engagement with Communities and its Amy Biehl Foundation Project. The Biehl project seeks to develop high school students’ critical awareness of the compelling human rights issues of the 21st Century and their sense of social responsibility for addressing human rights challenges (global and local) that align with their personal values. The guiding vision for the project is to cultivate students’ understanding of human dignity and the importance of confronting violence in any of its forms. Students are challenged to learn these principals while also working collectively and collaboratively in forming ideas and taking actions in response to social issues they deem important. This vision is based on values that were dear to Amy Biehl – a 26-year-old Fulbright scholar and anti-apartheid activist who worked for social change in South Africa, and who died at the hands of young black activists in 1993. In response to her death, her mother and father (Linda and Peter Biehl – both Whittier College graduates) founded the Amy Biehl Foundation Trust as a living memorial dedicated to educating and creating opportunity for the young people living in the South African township where Amy died. For more information on the Amy Biehl Foundation, visit facebook.com/usaabf. 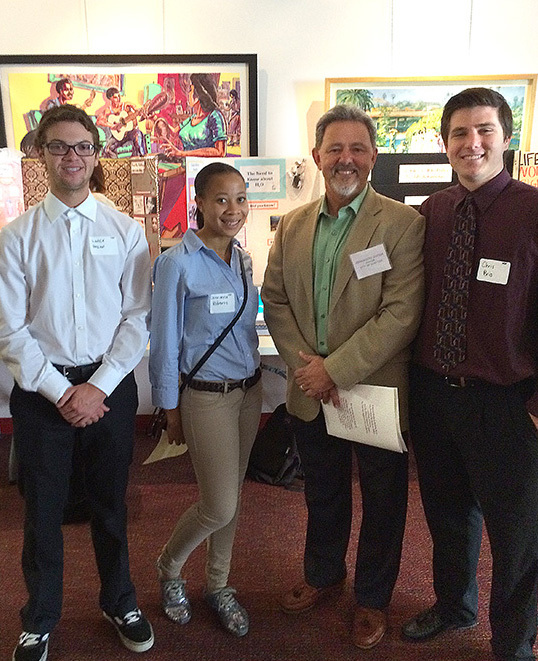 SENIOR PROJECT – Millikan High School seniors Lance Hazan, Dorrianna Roberts, Whittier Mayor Fernando Dutra and Millikan senior Chris Brio pose at Whittier College in front of the students' research project on the human right to access clean drinking water in developing nations.